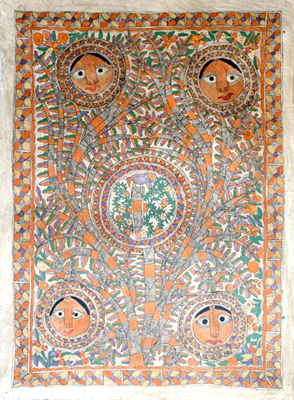 Mithila paintings first came into focus in 1934 when William G Archer, a British official, stumbled upon them while inspecting the damage caused by an earthquake discovered wall and floor paintings in the interiors of houses. From 1936 to 1940 he photographed some of these paintings, some of which are at display at the British Library in London. In 1946 Archer published an article on these paintings and later in 1977, his wife Mildred Archer provided further information and some interpretations of the paintings. A major turning point however came in 1966 when following a massive draught, the All India Handicrafts Board, in an attempt to rebuild the draught stricken economy encouraged the women of Mithila to transfer their wall and floor paintings (of gods from the Hindu pantheon, floral and geometric designs known as aripan and large colorful images of lotuses surrounded by paired fish, turtles snakes and love birds indicating fertility known as kohbar) onto paper so that they can sell them and generate income for their families. Most commonly these paintings at that time were done by the wealthy Brahmin and Kayastha women. Ganga Devi from the Kayastha caste and Sita Devi from the Brahmin Caste were the two pioneers of Mithila paintings on paper and their art was received enthusiastically by the public. They evolved two distinctive styles of painting. Ganga Devi did extremely detailed kanchi or line paintings using fine nib pens and only black and red ink, producing a kind of painting that came to be associated with the Kayastha community. Sita Devi developed the bharni style or “filled” associate with the Brahmin community. This style depicts large, colorful figures made using a straw or a bamboo stick either frayed at the end, or with a rag or wad of cotton at the tip, to serve as a reservoir for the paint. Through the 80s and 90s many other women of their caste followed their lead. Between 1972 and 78 Erika Moser, a German anthropologist, made several visits to Sita Devi’s village, Jitwarpur to study and film the crafts and rituals of the Dusadhs, a Dalit community. Moser urged the Dusadh women to also start painting on paper to generate additional income for the house. Unfamiliar with the complex imagery used by the Kayastha and Brahmin women, the Dusadh women encouraged by Moser, began to take inspiration from their own oral, cosmological and aesthetic traditions and created their own three distinctive styles and techniques. The first, initiated by Chano Devi derived from the tattoo images many of them had on their arms and legs. This style came to be known as godna (tattoo) paintings. These paintings largely composed of rows and concentric circles of flowers, fields, animals, figures and spirits drawn with a pointed bamboo pen and lampblack ink. This style was adopted my many Dusadh women and soon was further innovated to include the use of bamboo brushes and a range of colors made from flowers, leaves, barks, berries, etc. The themes of the paintings also expanded and they came to include complex scenes from their daily village life and ritual practices. The tree of life, images of Hindu Gods and the 27 legendry hero of the Dusadhs Raja Salhesh have also started appearing commonly in the paintings of Chano Devi and other artists using the godna technique. Till date godna remains the most popular style used by Dusadh artists. Chano Devi and her husband Rodi Paswan in their attempts to popularize and mainstream this art form have trained several artists. Ganeshwar Paswan, a fellow of Dalit Foundation is an artist trained by Chano Devi. Paswan has in turn trained five women namely with assistance from Dalit Foundation and is in the process of training 10 more in Madhubani. Inspired by the resolve of these artists, Dalit Foundation aims to create a training centre where more and more Dalits can be trained in godna art and be thus equipped to earn a decent livelihood. 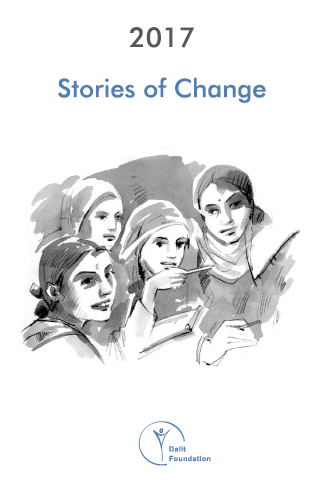 Dalit Foundation has also arranged for Chano Devi to train and guide five more Dalit women in godna with each of them producing three paintings a month. Through this programme the Foundation aims to link godna artists with the mainstream market in order to provide them with a sustainable source of livelihood and to cut out form the process the commission of the exploitative middle men. The second Dalit style of paintings was initiated by Jamuna Devi from the Chamar caste and was quickly adapted by Dusadh women as well. This style of painting produces large colorful images of deities and legendry figures using the frayed end of a bamboo stick. The most distinguishable feature of this style is the drawing of two lines with gobar (cow dung) with black dots between the lines to mark the frame as well as all around the depicted figures. In the 1980s Jamuna Devi innovated her style further by preparing the entire surface of the white paper with a light gobar wash to suggest the texture of a mud wall. Though this process caused some dismay earlier, due to its aesthetic and commercial success, it has now become a standard procedure for almost all Dusadh and some upper caste painters. The third style of painting developed by Dusadh artists was geru (brown) painting. This style was used only by two or three artists in the late 70s and 80s. The paintings depicted bold figures of deities, animals and plants mostly in brown with a few bright color contrasts. However this style did not attract buyers and soon disappeared from the repertoire. As can be discerned from the above tract, Dusadh painters have been extremely innovative and experimental in their styles and techniques and have been rapidly expanding the scope of their art. Images of Hindu deities especially Krishna and Shiva; the sun and the moon; various Dusadh rituals; Rahu, the Dusadh Sun God; of the life and adventures of Raja Salhesh; and the Tree of Life often filled with animals, birds, insects and sometimes even people are common imagery used by Dusadh artists conveying the variety of subjects in their art. Dusadh paintings have been both influenced by and have in turn influenced the paintings of other Maithili communities. In fact, they have also become part of the national mainstream art as several urban artists from other communities in India have been incorporating godna images into their paintings.